You don't know how to sew on a button or use a sewing machine? This is the class for you. You will make a needle keep as you learn about stitching by hand and machine. You'll also learn how to effectively use the basic tools of sewing. When you finish this class you will be ready for Quilting 101. This is a 6 week club every Tuesday, starting April 16th through May 28th (no class on May 21st) from 2-4:30. Learn a delightful way to rapidly piece with precision using a Layer Cake and Cake Mix Recipe. 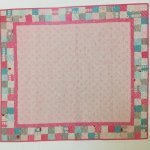 In this 6-week club, you will use 10" squares and paper patterns to make half-square triangle designs. Choose your own lay-out in creating a wall hanging. Learn to make perfect-looking pineapple blocks using the Pineapple Trim Tool ruler in this six week quilting club. Come make this fun, multi-zipper, multi-purpose bag! Your teen will become more familiar with their sewing machine and following patterns in this class. This adorable tote bag is made with just 2 fat quarters! The handle is optional. This club will take place on Thursdays from 12-2:30 starting May 9th and ending May 30th. Learn how to hand embroider a cute picture of your choice and mount it in a hoop. Fun bright colors of embroidery floss to choose from! Learn to use embroidery equipment, transfer designs, and master ten basic embroidery stitches. 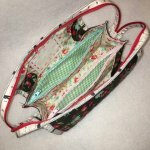 How about making a little pouch with a lace zipper? It will be a conversation piece and has so many potential uses. 24 hour cancellation policy to receive a store credit toward another class.